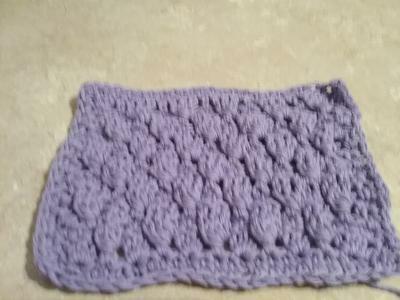 Use hook size 4.5 mm and 100 % cotton yarn. Row 1 single crochet in 2nd chain from hook, single chain in each chain across, turn. Row 2 ( this is the right side) chain 1 half double crochet in first single crochet, skip next single crochet, 3 double crochet in next single crochet, * skip next single crochet, double crochet in next single crochet, skip next single crochet, 3 double crochet in next single crochet* repeat from* to* across to last 2 single crochet skip next single crochet, half double crochet in last single crochet, turn. Row 3 chain 1, single crochet in each stitch across, turn. Row 5 chain 1 single crochet in each stitch across the row turn. Row 6 chain 1, half double crochet in first single crochet, skip next single crochet, work 3 front post triple around double crochet one row below next single crochet *skip next single crochet, double crochet in next single crochet, skip next single crochet, work 3 front post triple around double crochet one row below next single crochet* repeat from *to* across to last 2 single crochet, skip next single crochet, half double crochet in last single crochet turn. Repeat rows 3 to 6 for pattern.